Sugar Train Slots - Play FREE at Lord Bingo NOW! Step 1 – The first thing any gamer will have to do in any slot game is place their starting bet. Bets range from 1p to 50p per line. How much you want to lay down though, can be adjusted according to how daring you are. 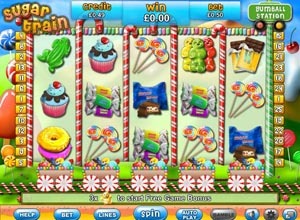 Step 2 – There are a total of 25 pay lines in Sugar Train slots. You can select how many lines you would like to have activated which range from the initial 1 to 25 individual pay lines. Obviously, the more lines you have on the go, the better your chances of winning are. Step 3 – Spin when your ready, and then there's nothing more you can do but sit and watch the reels reveal your fortune. If you have one that is! Anything you win will be dinging up on any winning pay line you have activated. The game is designed to resemble something out of a children's fantasy. With candy and sweets littering the game screen, it is hard not to think back to those sugar filled days as a child. The Sugar Train Slot machine has tapped into your childhood, and reveals everything you ever wanted as a child. Could it offer you everything you might ever want as an adult? The symbols represented on the reels of this Sugar Train slots game, are as you might expect, full of sugary goodness. Lollipops, wrapped sweeties, strawberry frogs, cup cakes, chocolate bars, doughnuts, jelly babies, and what appear to be gum balls all show up on the reels and will spin round to lead you what will hopefully be a fairly large sweet prize. So what is that prize? Well in Sugar Train Slots, 12,500 coins is the top prize. You'll need all the chocolates to pull of that though. If you're not that fortunate, then you can still get yourself a free bonus round by nabbing three of the scatter cards, represented by the jelly baby icons. To American audiences, they may be interpreted as gummy bears, but in the end of the day, it's down to your own interpretation isn't it?